During the economic boom of the late 50’s, the main drag through Corona sprouted several motels on duty as small roadside stops between large urban cities. Along with a few restaurants and service stations, Sixth Street was just one more typically garish corridor of necessities to travelers, and uncircumnavigable without a specific effort. One of the last surviving street icons from that era somehow made it all the way through with nary a scratch. 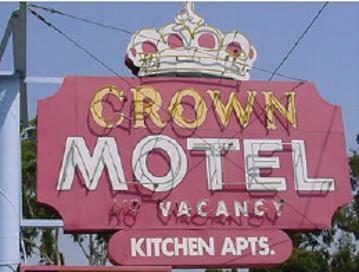 The elaborate neon sign stood at 1055 West Sixth Street advertising the newly remodeled motel that continues to operate there. It’s history is a little sketchy so far, but it’s known that it was operated at its opening by a L.H. & Mrs. F.M. Pollard, and its phone number was RE 7-6774. Beyond that, it’s hoped that someone will come up with a first-hand history. And the sooner the better, because the sign is to be placed on permanent exhibit within the Corona Heritage Museum. This all happened through a grant program administrated by the Corona Economic Development Department in which financial assistance was offered for commercial sign improvements. The grant, in this particular case, also provided funding for the delicate removal, crating and transportation to the museum. Upon inspection while the sign still hung above Sixth Street, all of the intricate neon tubing seemed to be intact. The paint, though somewhat faded, looked as though it has done a good job in protecting the sheet metal. It’s quite fortuitous that Corona now has a facility to receive and display such rare gems, an option that didn’t exist in 1999. It shouldn’t be too far in the future that you can once again view this glowing, flashing invitation of transitory slumber.